So, we’re still unclear on what makes a crocodile distinctly a crocodile, but we’re certain of at least a few things. Crocodiles are indispensable for any self-respecting villain who owns at least one trap door. The correct way to address one when you must be going is “In a while.” They’re not to be trusted around your chickens, goats, or children. And they make stellar mascots under every circumstance. 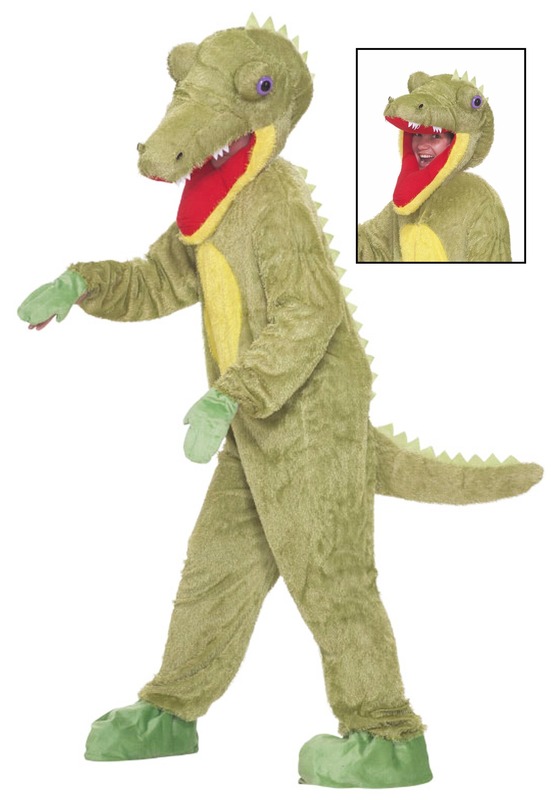 Our Mascot Crocodile Costume is the perfect thing to wear to any number of occasions -- this outfit even constitutes formal wear in some Floridian circles. The chartreuse jumpsuit exudes class, and people will applaud you for your sophistication while you’re glowering at them from the mask’s gaping, toothy maw. If someone you know is dressing up as Captain Hook this year, why not surprise them by showing up as their nemesis? They’ll really have to “hand” it to you for being so thoughtful.